Phungo 5 Returns with Capewood's Collections! Today is opening day for many teams across the Major Leagues, while the Phils open tomorrow versus the Houston Astros. This means the return of Phungo 5, and for the second consecutive year Capewood's Collections will help us out with the season debut of P5. 1) As an Astros and Phils Fan, how cool is it to have the Phils and Astros meeting on opening day? The Astros have played the Phillies pretty tough the past few years. It's hard to tell what the Astros are going to do in 2011. They finished last season strong but haven't looked too good this spring. It's always a tough decision for me as to who to root for. It wasn't too long ago when both teams had a chance for the playoffs and I would usually root for whoever I thought had the best chance. This year I think it's the Phillies and I'll be rooting for them. It would be cooler if Oswalt was going to pitch against them in the opening series but I think he is 4th in the rotation. 2) Who is your favorite player to follow that has been involved in the many Phils-Astros trades we have seen recently? Obviously, the Big O. He's been one of my favorite Astros and I heavily collect his cards. He hasn't gotten the recognition he's deserved while pitching in relative obscurity in Houston. I'm hoping he has a great season. 3) Thumbs Up or Down for the centerfield pole and Hill in Houston. A Thumbs Up. It's an interesting feature to have in a ballpark. It's fun to watch a right fielder trying to play a ball there. But to tell the truth, I think it's pretty rare for the Hill to be a problem. It's a long way from home plate. 4) Any News on the Bonsai Trees, I don't believe we have seen them in a while. Ah, the Bonsai Trees. I started this hobby without realizing how much effort it was going to take. I've lost a few plants but am now down to a number that I can deal with. I've got 8 healthy plants, 4 inside and 4 outside. It was a cold winter here with some freezing rain. I lost one plant because I didn't get them inside fast enough. I'm hoping to have them cleaned up and featured in a post soon. 5) What is your favorite Movie set in Houston? I had to think about this for a bit and look up movies on Wikipedia. The only movie which came to mind was Bill Murray's Rushmore. There are a few movies, which in some way or another deal with the space program, such as Apollo 13, Armageddon and Space Cowboys, but most of those movies actually take place in outer space. Arlington Road with Jeff Bridges and Tim Robbins was set in Houston but could have been anywhere. The subdivision where Arlington Road was located pretty much looked like a hundred different subdivisions in the Houston suburbs. And there there is Independence Day where the government sacrifices Houston while atomic bombing an alien ship. That scene where they show a road sign indicating a freeway exit to the University of Houston, used to establish that we really were in Houston, totally does not exist. There are a few more either set in Houston or filmed in Houston but I haven't seen them. All in all, I'd say Rushmore. It was a good movie and it was one of Bill Murray's first real serious roles and I like that side of him. Team Phungo frowns upon the Hill, but awards double points for coming up with Rushmore as a film recommendation. So 5 out of 5 for Cliff for the opening Phungo 5 of 2011. For a look back at Cliff's P5 from 2010 click here. Congrats to Plashke, Thy Sweater is Argyle for taking the 2011 edition of Spot the Sig! We had a fun and exciting competition this year with 7 different winners Identifying autographs. The last four innings were all won by either Plashke or 2010 Champion Card Buzz. I would like to thank all the teams for participating and hope everyone enjoyed playing STS! this season. Card Buzz IDd the Last auto, but didn't have enough runners on to unseat Plashke in first place. Many of this years autos were spotted in the first 5 minutes or so. The Boone Auto proved to be the most difficult of the competition I believe. A lot of folks starting going down the first name of PAUL route, either by reading the auto or via power of suggestion in the first couple of guesses. Waxaholic - Braves: Bases Loaded . Past Winners of Spot the Sig! We are down to the 9th and final inning of the 2011 edition of Spot the Sig!. I sincerely hope that everyone has enjoyed the competition. I apologize that the Autos were not quite as challenging as years past. I think I snuck in a few too many of the easy ones this time around, but I also believe the competition level has risen since the first STS! clear back in those innocent days of 2008-2009. Going into the 9th inning, Plaschzke thy Sweater is Argyle has a two run lead but there are at least six competitors that could take the game. Anybody that has the bases loaded has a shot, unfortunately Card Buzz - one of the All-Time Great STS! participants and reigning champ cannot win this game despite being in 3rd place and having 2 runs accross. Buzz simply doesn't have enough runners aboard to claim a victory with one big hit. The Auto is open to anyone, even if you cannot win the 2011 STS!, you can still be a spoiler. This is the last inning and there is no bonus competition. The Final Auto is either a Walk-off Hit or a Final Out. Thanks to all the participants. According to my records we had 19 teams enter this years STS! which is a new high and I am very happy about that. I hope that the game gave everyone a taste of baseball duirng the course of a rather long winter and has everybody ready for the upcoming real Major League season. A nice surprise package from Night Owl Cards arrived at Team Phungo Headquarters a few weeks back. NOC has traded with folks from across the nation and occasionally tracks the locations. I figure I have recieved 5 or 6 trade packages from the Night Owl. It amazes me that He finds time to blog. There were several Highlights in the package - Today I am focusing on the Prospects and the Phillies hobbled second baseman Chase Utley. 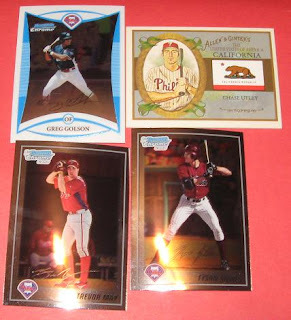 The Greg Golson card is from the 2008 Bowman Draft Set. Each year in this set there is a subset dedicated to the players featured in the years Futures Game. The 2008 game was played at the Old Yankee Stadium and Team Phungo was there. This card will go into the Phungo Games Attended binder - which is one of my favorites. The bottom row are cards from the 2010 Bowman Set and include Trevor May and Tyson Gillies. May is a 21 year old RHP had a pretty good year at Lo-A Lakewood in 2010 after a Rough start at Hi-A Clearwater. Tyson Gillies came over in the outgoing Cliff Lee deal - he lost most of 2010 due to an injury - his development was hampered further when Gillies was involved in a drug related incident with the Florida Authorities. Gillies was eventually acquitted of the offense, hopefully 2011 is a more productive season for the young man. As you likely know by now Chase Utley has not set foot on the field during spring training and there are whispers that Chase may be out for a large part of the 2011 season. This year is one that has a lot of promise for the Phils, I hope that Utley gets to take part. It is becoming a 2 team race as Card Buzz and Plaschke Buzz have picked up the Autos in the last four innings of Spot the Sig! 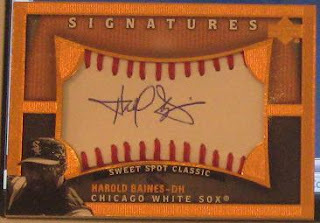 Congrats to Card Buzz for connecting on a 2 run homer by correctly identifying this weeks Harold Baines Auto. Harold Baines got his official Hall of Very Good Pass this year as he failed to get the thumbs up from at least 5% of the BBWAA balloters. A lot of folks have different issues w/ the HOF voting process for various reasons. I really do not have many problems with it, The automatics are automatics, The borderlines are borderline for a reason. Sure there are some dumb voters, questionable criteria and some daunting questions regarding PEDs and other issues - but for me it works well enough. I would like to see them add a "Deferment" vote, which the electorate could use to keep the player on the ballot but not give him a Yes vote. Had this been in place I think many voters would have at least kept Baines on the ballot for the length of his eligibilty. This option would also help voters separate first ballot HOF players from the next tier. Baines Near Hall of Fame Career spanned 22 seasons with for the Chisox Orioles Oakland Texas and Cleveland . He racked up 2866 Hits and 384 dingers. Much of this was accomplished as a DH and may have swayed the voters against Mr Baines. It should be noted that he did play over 1000 games in the outfield. Baines represented four different teams in Post Season play and reached the World Series with the Athletics who in 1990 lost to the Cincinnati Reds. His playoff numbers include 5 homers and a .324 BA. Harold Baines has more hits than any eligible player not in the Hall, Similarly with the exception of Rusty Staub and Rafael Palmiero every eligible player that has played more games than Harold Baines is enshrined in Cooperstown. Plaschke while unable to get the auto in the typical 10 seconds he usually does, was smart enough to quickly register his bonus guess as the New York Yankees. For those of you familiar with Branding you likely know the Yankees have one of the most recognizable logos in sports and commerce. This was also the only correct response for the bonus. Amazingly there were no Hockey Teams that made the cut. The Baseball Teams included the Dodgers and Braves. NFL teams were both the Broncos and Dolphins - I believe a Broncos fan may have lived in my neighborhood as I spotted their colors a couple of times. The College Logos belonged to the U of Michigan and Oregon. the NASCAR was Eliot Sadler. Other interesting sports related Apparel I saw were NBA and NHL League Logos and Solchi 2014. The Yankees sightings paced the other teams by tri-fold. STS! Standings after 8 inning. We are at the 8th inning of the 2011 Spot the Sig competition. Plaschzke, Thy Sweater is Argyle is on a roll, He is leading STS! and had knocked out two Autos in a row. But it remains almost anybody's game as several folks have runners on the bases. And the 8th inning Auto should score somebody a run as it is worth a Home Run! If you have been checking in here over the last couple of the months, your probably aware that Team Phungo spent last fall in Moscow. During the eight weeks we were in Russia I took an informal survey of the shirts, hats and other apparel that I saw there. Your task for the Bonus is to come up with one of the American Teams who I spotted a Cap, Shirt, Jacket or other piece of clothing for. I restricted my survey to these 4 Leagues MLB, NBA, NFL, and NHL. I did spot two different College Shirts (D1 Football) and 1 NASCAR shirt, if you really want to guess at those needles in a Haystack knock yourself out. I also saw lots of Futbol and Formula 1 Racing Garb, but I am unfamiliar with those teams so didn't bother keeping track of those teams. Likewise we will not be counting Russian Futbol or Hockey squads. STS! Standings going into the 8th inning. Plaschzke thy Sweater is Argyle - Brooklyn Dodgers: 4 Runs, Men on First and 2nd. Rhubarb Runner - Twins: Bases Loaded Waxaholic - Braves: Bases Loaded . Plashke strikes again! James Loney Double plus the bonus to put runner on first and 2nd with 4 runs already across. Louisiana Lightning - In 1978 Guidry went 25-3 and posted a 1.74 ERA. When I was a kid this was unfathomable and remains so to me today - even after watching Roy Halladay go out there every fourth day for the Phils. Guidry's 1978 performance earned him a Cy Young award - he finished 2nd in the MVP voting to Jim Rice. Guidry's spent all 14 years of his career in pinstripes. During his tenure the Yankees captured two world Titles in 1977 and 78 returning to the playoffs in 1980 and 81. I believe Ron Guidry also holds the distinction of being the first player to make his first career Major League At Bat while appearing in a World Series Game - I checked around the -Net but couldn't confirm this. It's one of those weird chunks of trivia that thinks it is in my faltering brain, but isn't sure. UD Origins are good looking on card autos. This one went for #4.49 via eBay last year. Current auctions have the card priced at $8.40, which is the low among completed auctions for Guidry's Auto cards. The Yankees Signature Series Guidry Auto just sold for $9.50. The Topps Ron Guidry Rookie Card is a quad RC, #599 within the 1976 Topps Set. The Rookie Pitchers card also features Pat Zachary who started a number of years for the Reds and Mets. This card has sold for a range of $2.05 to $8.50 via auction, but I suspect that it can be had much cheaper. Guidry's first solo card is #656 in the 1977 Set and is basically a common. Five out of 12 contestants picked up bonuses. Oddly early answers worked against most folks as the early guesses tended to be incorrect including 2 misses by the Rhubarb Runner. In addition to Plashke (Green Day who I saw in a small club in Allentown roughly 20 years ago), Night Owl, Captain Canuck (Waxaholic), Jim (Phillies Room), and Nathan all picked up the bonus. I have had a few music related postings here, and most of the shows I see are on the more intimate side and local so if you chose those acts you were more likely to get the bonus. 3 bonuses were left avalialbe Evan Dando (which may have been hard to read in the photo), Pat DiNizio (of the Smithereens), and Chuck Prophet. STS! Standings at the 7th inning Stretch. Six innings of Spot the Sig! in and Six different winners. Plaschzke thy Sweater is Argyle has jumped out to a big lead with a Grand Slam Home Run, but the 2011 STS title remains up for grabs as just about everyone has ducks on the pond. The 7th inning auto above is good for a Double. 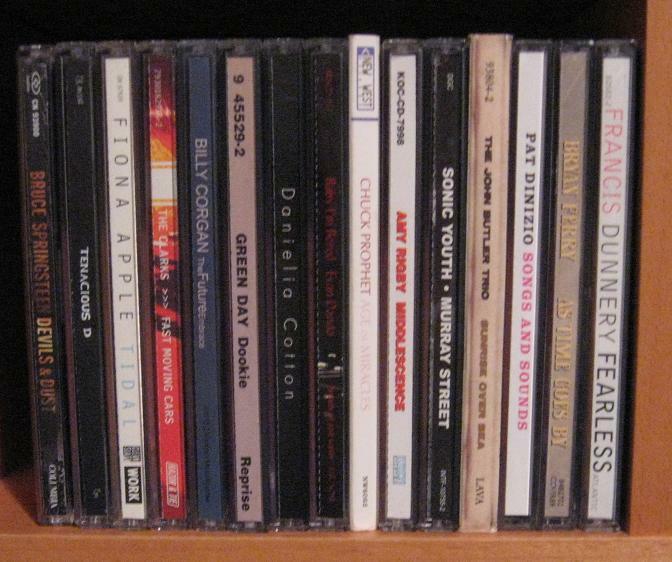 Above is a small portion of the Team Phungo CD Collection, your task for the Bonus is to pick which artist among the CDs above team Phungo has seen live in concert. Ground Rules - Duplicate guesses are not allowed. 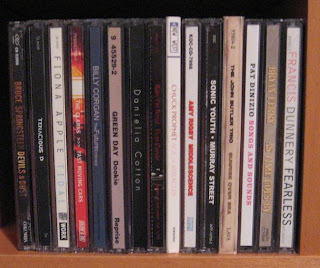 There are only 15 CDs pictured, if all 15 CDs are chosen prior to you getting your guess in, I am sorry, but you have gotten shut out. The Bonus is good for a Walk and will close at noon on Tuesday. STS! Standings Going into the 7th inning. Waxaholic - Braves: Men on First and Third. 2011 Topps Heritage on the loose. I haven;t seen them personally but 2011 Topps Heritage (Retail) is live and in stores as reported by the Phillies Room. The -Bay also has dozens of cards on sale - appears to be several short print variations, including Shane Victorino green variation. A few months ago Samuel from The Daily Dimwit saw the January Pull n Junk post that featured a Jason Castro auto as the Team Phungo Pull of the Month. DD is an Astros fan and we were able to work a trade that involved a couple of autos being swapped plus some additional cards. I am saving the Autos as possible future Spot the Sig! fodder, but I would like to share a page full of the other cards that Mr Dimwit sent my way. 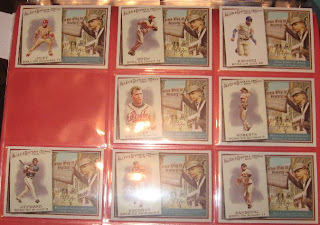 As you may remember this is the This Day in History set from 2010 Allen & Ginter. Above you see cards 1 through 9 minus #4 Lance Berkman. I enjoy most of the common A&G inserts sets. They are typically a small set (30-75 cards) and fairly common. Samuel was good enough to send almost the entire set my way and I am currently down to the final four cards. I particularly enjoy this set as it has a history element connected to each players card. As a nice bonus Chase Utley has the #1 card and is in the top left of the above page. Thanks again DD and I am looking forward to Opening day when the Phils Host the the Astros! GRAND SLAM for Plaschke, Thy Sweater is Argyle as he identified Andre Ethier as this weeks auto. Congrats to team Plashke, a newcomer to Spot the Sig! this season who picked the right time to pick up their first Auto. This is also the first time that a Grand Slam has been hit in STS! history. 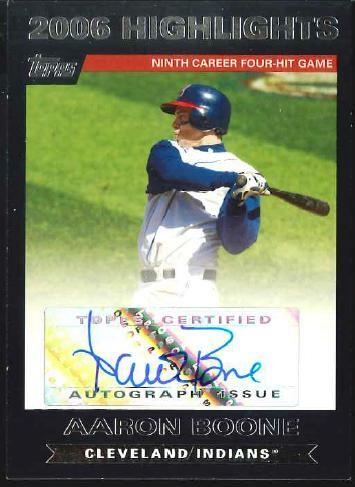 Sorry to AdamE this is not from 2008 Bowman's Best, which he had guessed in the comments. There wouldn't have been a consolation prize for that but it was a worthy try regardless. The low recent eBay auction for an Ethier Auto is $7.11 for a sticker auto out of the 2011 Topps Set. Another 2008 UD SP YSS auto like the one above went for $7.24. I picked this one up at a card show for $4 a few years ago. One of the better looking available Ethier Autos is the 2008 UD Masterpieces card which has gone as low as $8.55. The Andre Ethier Auto's topped out at $328.00 for a BGS slabbed (9 out of 10) 2005 Topps Xfractor Auto. I picked up a bunch of vintage Bowmans from two different Dollar Bins. 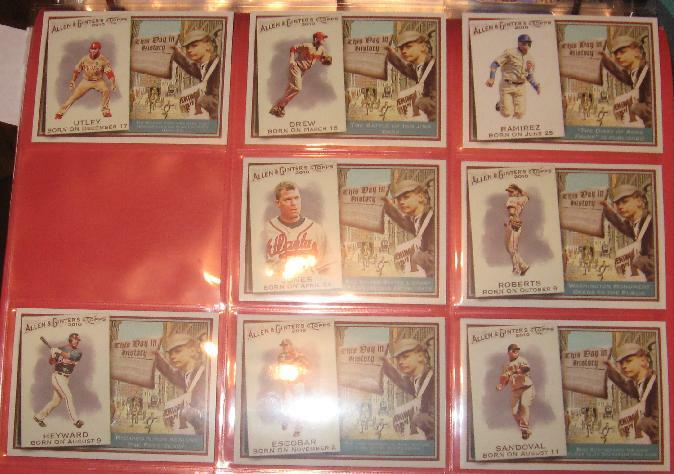 The oldest of these was a tattered 1948 card of Jack Lohrke which is located in the center of the above photo. Congrats to Rhubarb Runner who went back the furthest of any STS! players and correctly came up with 1948. Does anyone think this tidbit would show up on the back of a card today? According to the Jack Lohrke wiki page the other brush with death that he survived was while serving in the Army during World War II. Lohrke was bumped from a ill-fated military transport plane that would later crash. Lohrke (nicknamed 'Lucky') played in parts of 7 major league seasons including a handful of games with the Phillies. He appeared in the 1951 World Series in which the New York Giants lost to the Yankees. STS! Standings Going after 6 innings. I think somebody is going to score a run tonight, as this weeks Auto is worth a Home Run! Through 5 innings we have had five different Spot the Sig! winners. Everybody has been diligently working on the bonus questions, so there are a lot of ducks on the pond. STS! Standings Going into the 6th inning.